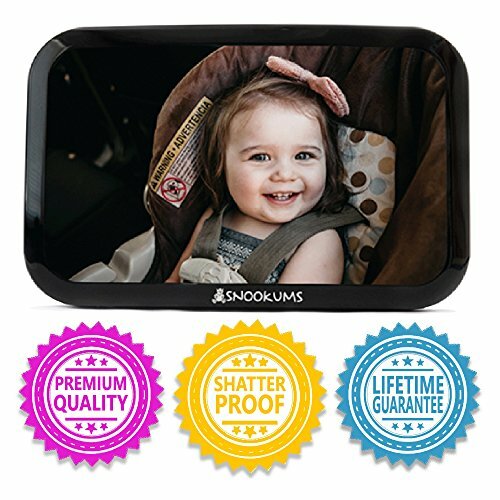 Snookums has created a better driving experience for you and your child. your baby's development in those crucial years. It's convenient, safe and exceptional! We know that your experience is only as good as the product. We made the best mirror so you that you could have the best experience! Scroll to the top and click on the "button" that says "Add to Cart"
100% LIFETIME MONEYBACK GUARANTEE - We love to serve our customers! If you are at any point unsatisfied with this excellent baby mirror, we will offer you a full REFUND. We make quality products and we give quality service to the people we care about. SHATTERPROOF GLASS - Your child's safety is of the utmost importance. That's why this mirror was designed with shatterproof acrylic material and an exceptional strapping system to securely hold the mirror in place even after the most unexpected of bumps. EASY INSTALLATION - This mirror comes pre-assembled and is easier to install than placing your baby in a car seat. The simple 2-strap design is easy to secure and holds extremely well. QUALITY VIEWING - The convex shape of our mirror allows for excellent driver-to-backseat viewing and gives your child the ability to see you while driving as well. What a great traveling experience for your family! STABLE MIRROR JOINT - No shaking or falling out of place. The 360 degree joint on the mirror not only allows for exceptional adjustment, it also stays in the position that you leave it in even when the ride gets bumpy. If you have any questions about this product by Snookums, contact us by completing and submitting the form below. If you are looking for a specif part number, please include it with your message.